Designed and constructed to stand up to the toughest conditions and operating environments, Top-Flo® Sanitary Stainless Steel Ball Valves deliver precise control from partial to full flow. 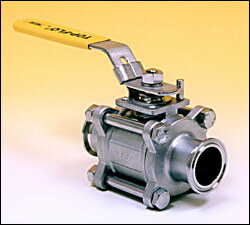 Top-Flo® Sanitary Stainless Steel Ball Valves feature easy, 360o installation and equally easy servicing, thanks to a unique design that allows the ends of the valve to remain connected to your piping while the body is serviced. Available in sizes from 1/2″ through 4″, Top-Flo® Sanitary Stainless Steel Ball Valves are USDA approved and rated for 1000 psi at 70oF.